With NBA free agency beginning July 1, the Miami Heat and Dwyane Wade will once again try to agree to a new contract to keep the 34-year-old guard with the team. However, that plan has already hit a speed bump. According to ESPN’s Brian Windhorst, the two sides reportedly couldn’t find a “common ground” in contract discussions Tuesday, leading to Wade’s representatives letting teams know Wade will be on the market this summer. Of course, this could easily be a negotiating tactic by Wade and his team to try to force Miami’s hand. As Windhorst notes, Wade and the Heat had several contentious weeks last summer while Wade was a free agent before they eventually agreed on a one-year, $20 million deal. Yet there’s reason to believe this summer could actually be different. While a divorce between Wade and Miami, where he’s spent all 13 years of his career, seems unimaginable, the Heat are facing some difficult decisions this off-season. The Heat are considered one of the front-runners to nab Kevin Durant if he leaves Oklahoma City, and they’re also trying to retain breakout center Hassan Whiteside and forward Luol Deng. Simply put, the Heat can’t afford to pay all four players at their market value. Deng would seemingly be the odd man out, but even then, the Heat can’t logistically sign Durant, Whiteside, and Wade to max. or near-max. contracts at the same time. It would either take major concessions from all three or the Heat will have to prioritise. This is dependent on Durant choosing to sign with the Heat, of course, but they are one of the teams he’s scheduled to meet with when free agency begins. 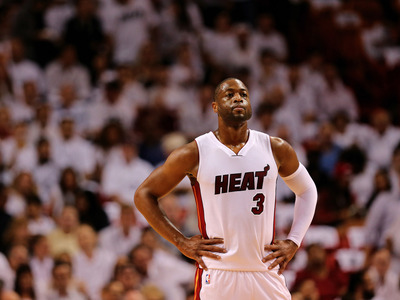 This all leads to an awkward atmosphere for Wade and the Heat to negotiate under. According to Windhorst, the Heat have $40 million in cap space. If they were to sign Wade to a deal that pays him $20 million per year, they won’t be able to afford Durant, unless they clear more cap space. Ditto for Whiteside, whose max. contract with the Heat would pay him over $24 million per year. The Heat would have to first sign Durant (or any other big free agent) with their cap space, then, because they own Wade’s Bird rights, they could go above the salary cap to re-sign Wade. Yet this is asking Wade to wait in limbo while the Heat handle seemingly bigger priorities, something that doesn’t exactly stroke any star’s ego. There’s also the matter of what Wade’s market value is. Last season, Wade was mostly healthy and productive, playing 74 games while averaging 19 points, four rebounds, and four assists per game — one of his best regular seasons in several years. But at 34, with lots of miles, and a game based on athleticism, how much are the Heat willing to pay Wade, and for how long? None of this means a divorce is inevitable, but it’s unlikely that these contract negotiations will be settled quickly. At the very least, for the Heat and Wade to remain together, it seems like there will have to be some big concessions from both sides.